True, a Wall Street Journal report cited Indonesia and Australia as the "most promising" among four coal providers, besides China and India, for Vietnam. Sitting astride the Gulf of Thailand and the East Sea, Hon Khoai Port is well sited to receive Indonesian and Australian shipments. But the decision to build the portdoes not really make complete economic sense - until it is superimposed on the potentially heady commercial traffic the Kra Canal stands to provide. The project has undergone two different configurations, but both set-ups cater to commodities beyond coal. The current configuration is the outcome of the 2015 feasibility study undertaken by Bechtel Corporation, the United States' largest construction and civil engineering company, in a deal signed with Vietnamese firm Van Phong. This set-up will see 12 transhipment berths planned for the port, half of which will be dedicated to non-coal imports. The previous configuration, by the Vietnam Marine Administration in partnership with Australian- based N&M Commodities, called for 24 piers in which only half were for coal. The rest would cater to bulk goods, containers, petroleum, LNG (liquefied natural gas) and roll-on/roll-off ships designed to carry wheeled cargo - the very commodities and products that would pass through the Kra Canal and coming from as far as the Middle East and Europe. If the current arrangement with Bechtel follows through, Hon Khoai Port pins US commercial interests right at the centre of the new geo-economic picture shaped by the transformative power of the Kra Canal. In addition to the strong American clout brought in through Bechtel, it is also reported that 85 per cent of Hon Khoai Port will be financed by the US Export-Import Bank. Ex-Im Bank, as it is known, is the US export credit agency. The role of Bechtel and Ex-Im Bank likely signals strategic movements by the US to ensure it does not find itself on the outside of an Asian economic architecture being shaped by China. 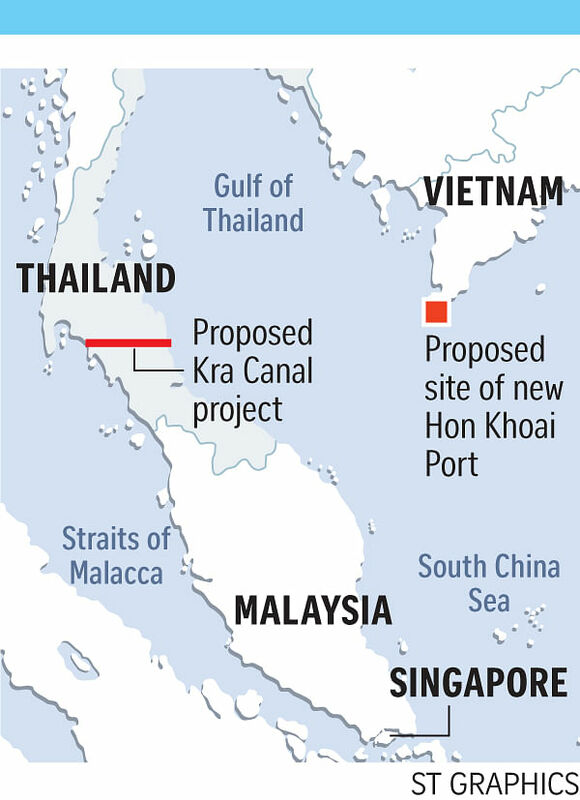 The Kra Canal would not only transform Thailand into a regional maritime centre that could trump the Singaporean and Malaysian port hubs along the Malacca Strait. It would also serve as a critical artery of China's Maritime Silk Road, now part of the country's "one belt, one road" blueprint. Chinese involvement would surely see its newly founded Asian Infrastructure Investment Bank (AIIB) - designed to finance large-scale infrastructural projects - weighing into this particular project. Nationalist types chattering within China's influential virtual communities such as Tiexue Luntan (the Iron and Blood Forum) are already calling for the AIIB to inject life into Thailand's long-held dream of building a Kra Canal. At the end of the day, though, the relationship between the Kra Canal and Hon Khoai Port would amount to mere conjecture if not for the fact that Vietnam's media coverage on the port project came at the same time in July that the third joint Cabinet meeting between Thailand and Vietnam was held in Bangkok. Significantly, the outcome of the latest discussions between Prime Minister Nguyen and Thailand's Prime Minister Prayut Chan-o-cha was a statement stressing the importance of resolving disputes through peaceful means in accordance with international law, including the 1982 United Nations Convention on the Law of the Sea, and boosting dialogues and consultations to reach a Code of Conduct of Parties in the East Sea. Thailand's Kra Canal and Vietnam's Hong Khoai Port now both sit within the larger US-China competition over cooperative economic projects within Asean as China pushes for regional leadership - at least in economic terms - and as the US "rebalances" to Asia to maintain its own influence. As both projects are also adjacent to the South China Sea - and the current US-China tensions manifested therein - the Kra Canal and Hong Khoai Port must be assessed in the grander context of regional order setting driven by these two foremost powers of our times. • The writer is a research fellow at the Institute for Defence and Strategic Studies at the S. Rajaratnam School of International Studies. • S.E.A. View is a weekly column on South-east Asian affairs.